Many employees find themselves in the computer industry without formal qualifications. They typically received in-service training in the "technology of the day", which becomes obsolete within a short period of time. Enterprises are aware of this, and prefer that employees are educated in the fundamentals of the discipline. 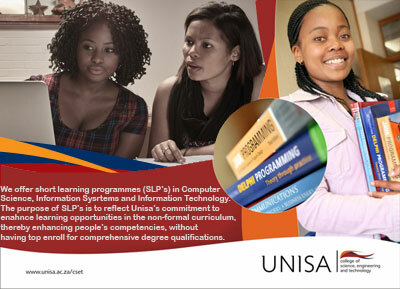 The aim of the School of Computing's short learning programmes is to provide an environment where students can study the underlying principles of a particular field of interest and be rewarded with a UNISA certificate upon successful completion of the course. Some courses focus strongly on practical issues with various sessions of training while other courses focus on the theoretical principles forming the basis of a particular field.